Location: Prominent Gothic Revival church occupying the centre of an oval of mid-Victorian terrace housing. The church was designed in 1854 by J Prichard and J P Seddon but it was built in stages, nave 1854-5, aisles 1858-9, aisled chancel and crossing steeple 1868-70, the steeple to a revised design by W P James; nave west bay added in 1902 by G E Halliday, who probably also added the choir vestry. The church's appearance between 1870-1902 is recorded in a watercolour in the choir vestry. Minor alterations and additions by George Pace in the late 1950s. The one difficult question concerning the church's history is the extension to the nave. The church guidebook says that the fifth bay and the extension were added to the west end of the nave in 1902, whereas the available illustrations show the church with only three bays, rather than four, to the west of the tower. Walling of multi-coloured coursed squared rubble with Bath stone dressings and Welsh slate roofs. Nave, chancel, north and south aisle, crossing tower, north-east choir vestry, north porch. C14 Decorated style with Geometric tracery. The nave is almost covered by the aisles below the clerestorey which is lit on either side by five circular cinquefoiled windows. The added west end of the nave projects slightly with a pointed arched door on the south side. Very steeply pitched roof with coped gables. The west end has stepped corner buttresses. Large 4-light window with a wheel above paired trefoil leaded lights which are topped by trefoils. The south aisle runs for six bays in front of the nave and the tower, the bays separated by buttresses. Each bay has a 2-light window with trefoil head as in the west window. The north aisle windows are the same except that the fourth bay from the left is a projecting gabled porch and the first bay from the left is hidden by the added choir vestry. The vestry has a roof parallel with the nave. Three single light windows with cusped heads and a continuous dripmould over. Similar window in the west gable, the east gable is covered by an added office of c1955. Three stage tower with the ground stage hidden by the aisles. Octagonal stair turret clasping the south-east corner. North and south circular foliated windows on the second stage. The belfry stage has a 2-light opening with central colonnette on each face. Ashlar broach spire, with a bracketed canopy above each broach, a gargoyle at each corner and a gabled 2-light opening with quatrefoil head on each face. The chancel is short with a lancet on either wall and a diagonal corner buttress. Large east window with five lights, paired ones with cinquefoil heads flank a single one with trefoil, septfoil above. Steeply pitched coped gable. Five bay arcade of pointed arches supported on circular columns. Tower arch and chancel arch with inner order dying into the jambs. Roof with close set double scissor braces. Lean-to aisle roofs supported on stone arches with circular openings in the spandrels. The chancel has Minton floor tiles and probably Prichard designed stalls. Reredos 1890 by Kempson and Fowler, carved by Clarke of Llandaff. Altar rail dated 1925. Organ dated 1922 by Blackett and Horde. East window 1897. West window 1936. Nave benches are Victorian. Reader's pew 1936. Pulpit 1936. Nave altar 1989. The font is Victorian, an octagonal limestone bowl supported on clustered red marble piers, wooden cover dated 1965. Choir vestry with a three bay arch braced tied roof. The vestry contains a watercolour of the church between 1870-1902. 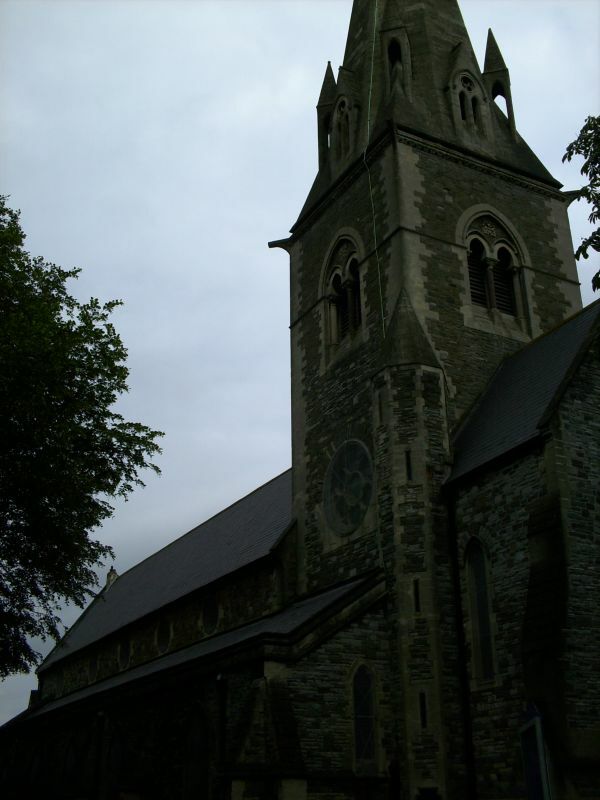 Included as a largely Prichard and Seddon church which, despite some alterations, has retained its character well and makes an important contribution to this part of Canton. At Canton Cross on the corner with Church Road which leads down to Prichard's church of St John the Evangelist and forming part of a good group with The Corporation PH and Canton Library.